If you are looking for a biometric signature solution that ensures and protects all your digital signature processes, Branddocs is undoubtedly one of the main points of reference. Its TrustCloud Biometric Signature solution will allow you to extend the layers of security and electronic proof of your digital transactions. What is a biometric signature? A biometric signature is a technology that captures the image of the handwritten signature using digitizing tablets with the biometric data of the signer - speed, acceleration of writing, pressure, inflections, changes of direction and sweep of the pen. These characteristics uniquely identify the signer since they are traits that are inherent to the person and make it possible to authenticate each individual. Like other electronic signatures, a biometric signature makes it possible to sign documents without the need for paper. Any type of business or personal procedure can be carried out with this technology. 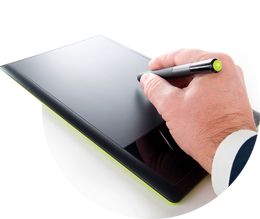 Using digitizing tablets (or other devices prepared for biometric signing) the parties can close deals and finalize contracts, and all with a high level of trust similar to the handwritten signature on paper, with the same legal and judicial validity. This is because the document is saved not only with the signer's signature, but also with the person's biometric data, which will be attached to the document. The entire set of evidence will be encrypted and duly stored in order to ensure authenticity and security. Fraud prevention: this is made possible by identifying the signer at the time of signing. Guaranteeing the signature: the signature process cannot be closed until all the requested signatures have been collected. Document and signature auditing: the technology makes it easy to verify the authenticity of the documents and their signatures. Improved processes: the digital processes streamline the way all types of personal or professional procedures are managed, increasing their efficiency and transparency.